If there were ever a morning that needed both a decadent and easy brunch, Christmas morning is it. Every year, before any presents can be opened, my whole extended family sits down together for Christmas brunch. It’s a decadent affair; the kind that leaves you happily comatose on the couch for hours afterward. There is always champagne, lots of hot coffee, an egg casserole, fresh fruit, and best of all, homemade pastries. As a child, I despised this tradition that kept me away from the presents that were veritably calling to me from inside their wrappings under the tree. I couldn’t gulp down my chocolate milk and muffin fast enough, and impatiently tapped my foot (or did slightly more obnoxious things) until the adults were finally finished eating. I couldn’t understand why anyone would want to enjoy a leisurely brunch when there were presents to be opened. Now, however, I appreciate the rarity of a slow morning with family. All year long we wait for this day, when there are no deadlines, no commutes, no conference calls. On this day, the items on the to-do list are: eat, drink, be merry. Real clothes are totally optional. Presents are fun, but they’re not the main event. The biggest gift is the one we so rarely can give in this world: time. Every year for this loveliest and slowest of brunches, my mom and I do something different to try to top the last year’s pastry foray. One year there was a sweet cream cheese yeasted danish that was so ambitious, we were up into the wee hours of the night waiting for it to rise. In other, lazier years, there have been lemon poppyseed quick breads and apple muffins. The complexity of our project usually depends on how many presents we have wrapped by Christmas Eve. This year, however, I’ve decided to make something that tastes like we spent all day making it, but really comes together in a flash. The magic of puff pastry! 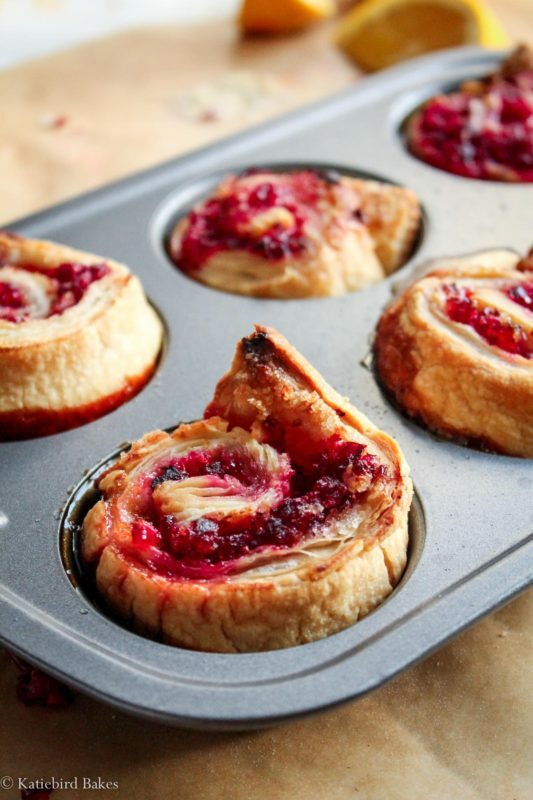 I concocted this idea after seeing a video on Instagram for Ina Garten’s sticky buns, which used puff pastry and a muffin tin to create decadent rolls in what seemed like mere seconds. 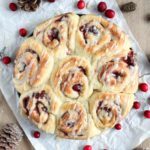 Now, real life is not quite so easy as a recipe video, but these still qualify as easy to me compared with traditional yeasted cinnamon rolls. 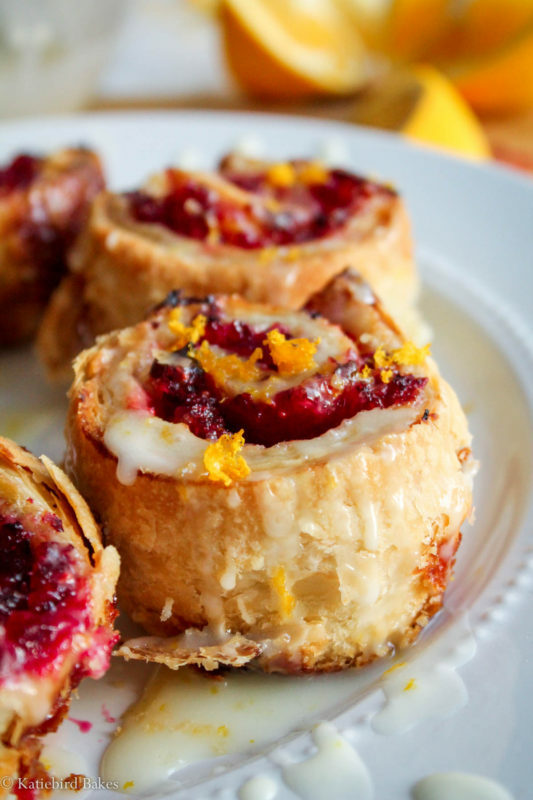 No kneading and rising, and using the seasonal flavors of fresh cranberry and orange. Let’s do this! 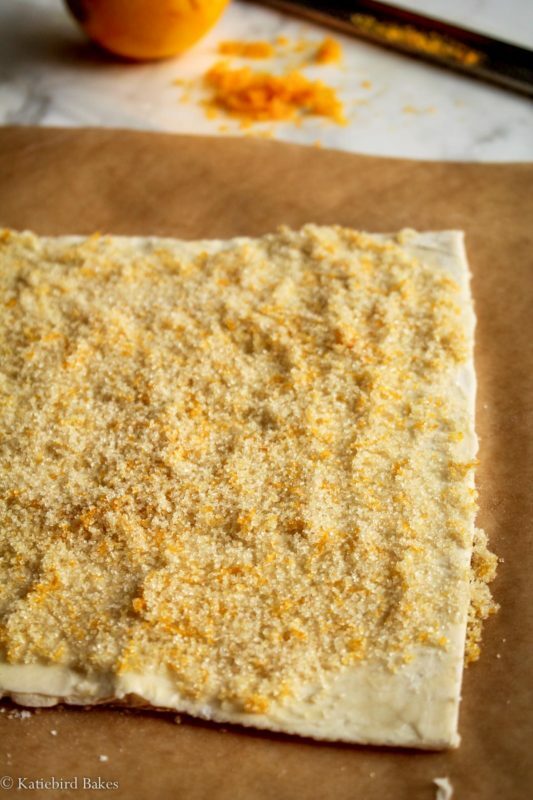 Start out with one sheet of frozen puff pastry, defrosted (you can set it out at room temperature or give it a few quick bursts in the microwave). We’ll spread it with butter and top with orange-zested-sugar (simply rub orange zest into sugar with your fingers – it releases the citrus oils and makes the sugar fragrantly orange!). 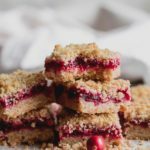 Then, blitz some fresh cranberries in your food processor or blender until crumb-like, and sprinkle them over top. Then roll it up tightly, like a cinnamon roll, starting with the edge closest to you, and end with the seam side down. 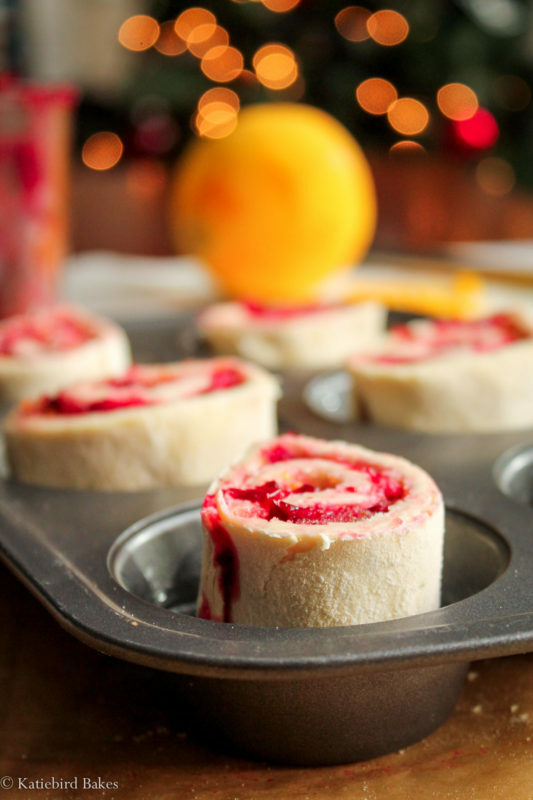 Cut it into 6 slices, and put each roll spiral-side-up into a muffin tin, preferably lined with cupcake liners unless you want to spend a lot of time prying them out afterwards. Hardened sugar = concrete. Then bake them up until they’re beautifully flaky and golden brown, and remove to a plate. Drizzle generously with a simple orange glaze, and watch your family’s eyes light up as they take their first bite. Christmas morning, you’ve never looked so good. 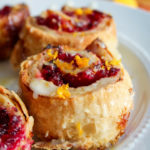 Perfect for Christmas morning, these easy cranberry orange rolls are made decadent and flaky with puff pastry, fresh cranberries, and orange zest. Preheat oven to 400 degrees F. Prepare a muffin tin with 6 cupcake liners (highly recommended) or grease VERY well (be prepared for a mess). 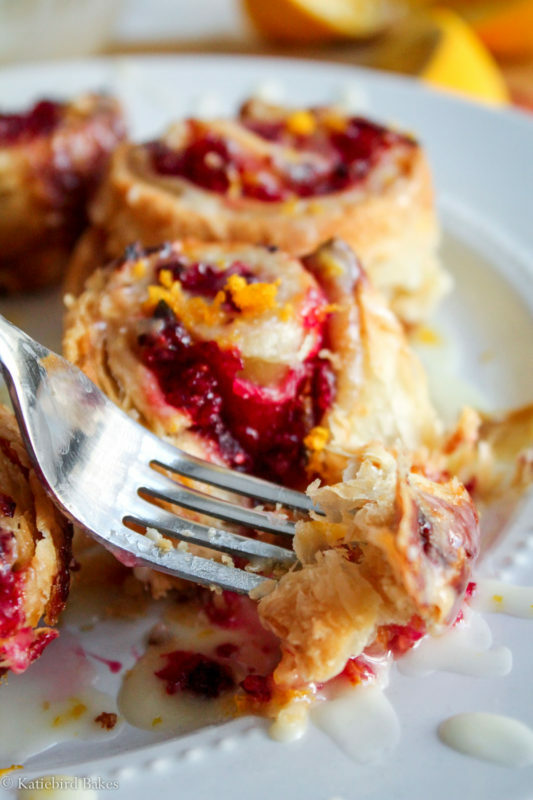 Unfold puff pastry on a piece of parchment paper or counter dusted with flour. Spread melted butter over it evenly. Take half the orange zest, place in a bowl with the granulated sugar, and rub it together with the sugar with your fingers until sugar is fragrant with orange. Sprinkle sugar mixture over the melted butter evenly. Pulse the cranberries in a food processor (or very finely chop) until they resemble coarse crumbs (do not fully purée). Sprinkle cranberries over the sugar. 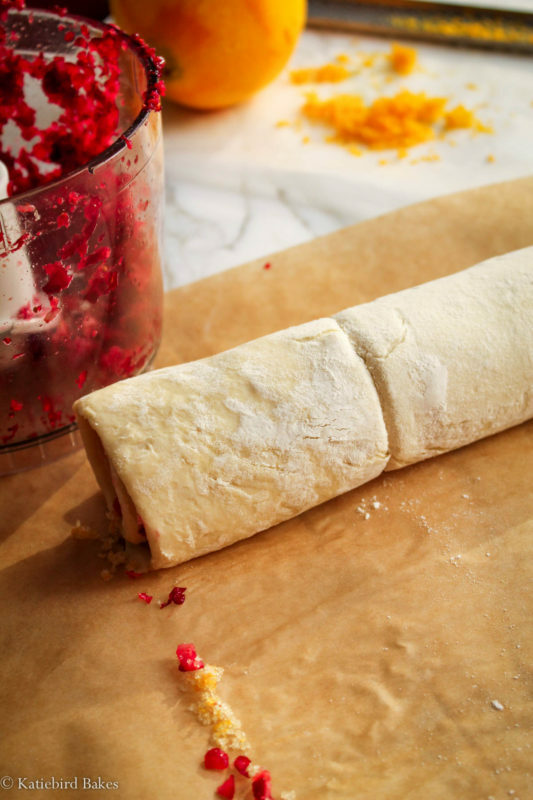 Roll up the puff pastry tightly, starting with the side closest to you. Keep the seam side down at the end. Cut into 6 even slices. Place the rolls, spiral side up, in each cup. 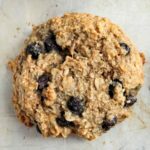 Bake for 30 minutes, or until golden brown and bubbly. Meanwhile, whisk together the confectioner's sugar, remaining orange zest, and the juice of 1/2 the orange (about 1/4 cup juice). The glaze should be thick, but still able to pour. When the rolls are done, carefully remove them from the muffin tin as quickly as possible to a plate (so they don't get stuck in the muffin tin with hardened sugar like concrete - not that I speak from experience or anything...). Drizzle with as much glaze as you like. Serve warm! 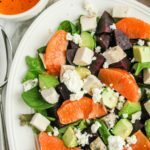 Recipe can easily be doubled! Just follow the same instructions with a second sheet of puff pastry.